"A unique salad, packed with iron! Your kids will eat spinach, as long as you don't tell them it's spinach. Popeye would have loved this!" 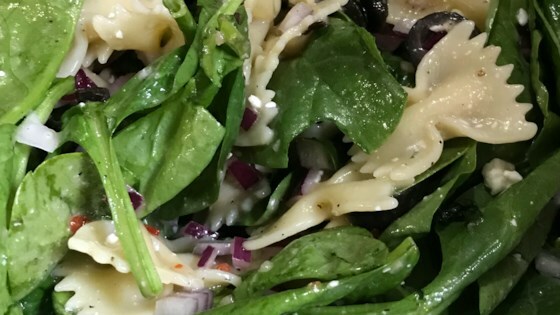 In a large bowl, combine the pasta, spinach, cheese, red onion and olives. Whisk together the salad dressing, garlic, lemon juice, garlic salt and pepper. Pour over salad and toss. Refrigerate for 2 hours and serve chilled. A delicious mix of fresh spinach and pasta tossed with olive oil, garlic, and prosciutto.